When you overuse your voice, your body tries to cushion the vocal cords by pooling together edema (fluid) beneath the vocal cord mucosa (the surface layer of the cords); this pooled edema is like a small, low-profile blister on your finger. If after a few days you stop overusing your voice, the edema disperses readily, within a few days, and this “blister” on the vocal cords vanishes. If, however, the amount or manner of voice use remains excessive for many weeks or months, then more chronic swelling materials (no longer just edema fluid) are laid down by the body, and the vocal cords develop true nodules. In either case (acute swellings or chronic nodules), this injury to the mucosa can impair the voice in two ways: it reduces the vibratory flexibility of the mucosa, and it interferes with the accurate match of the cords when they come together to produce voice. This impairment causes the voice to be hoarse or, more subtly, to suffer from onset delays, difficulty with high notes, and other similar problems. Nodules will often dissipate, with the help of rest and perhaps speech/voice therapy, over a period of weeks or months. Sometimes, the swellings are so stubborn that surgery is required. Strobe light, phonation, open phase of vibration, at the pitch D5 (~587 Hz). There are vocal nodules on both vocal cords, of very long duration, even after voice rest and speech therapy. Compare with photos 3 and 5. Same as photo 1, but during the closed phase of vibration. 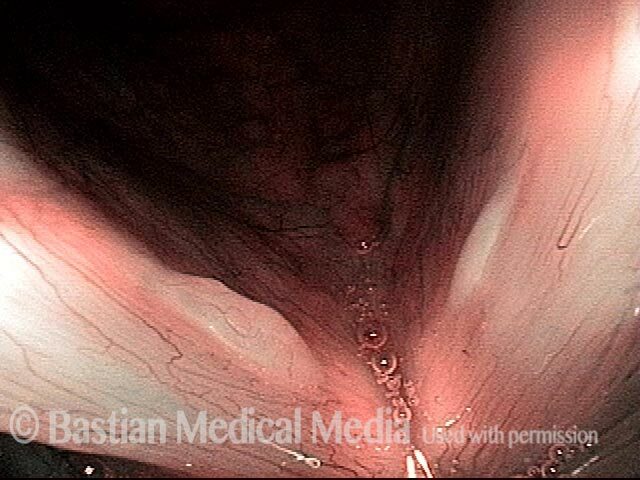 The nodules keep the vocal cords from coming together completely (as seen here), making the patient’s voice breathy. Compare with photos 4 and 6. Same as photo 3, but during the closed phase of vibration. Same as photo 5, but during the closed phase of vibration. Voice is no longer breathy, and the upper range has been restored. Polypoid vocal nodules in a “vocal overdoer” with phenomenology typical for a mucosal injury. Narrow band illumination (blue-green light) makes vasculature more prominent. Note also the fusiform (long, low-profile) swelling, best seen on the left cord (right of image). Phonation, strobe light, at the beginning of the closed phase of vibration; one can see that closure will be incomplete due to early contact of the polypoid nodules. Phonation, strobe light, closed phase of vibration, with persistent gaps anterior and posterior to the polypoid nodules. Phonation, strobe light, open phase of vibration, continues to show the mid-cord swellings. Vocal nodules under standard light. Note asymmetry in size. Closed phase of vibration, with notable translucency of the right vocal cord (left of image), which is often a predictor of chronicity and only partial response to speech (voice) therapy. Open phase of vibration, strobe light. A week after vocal cord microsurgery, standard light. Closed phase of vibration, strobe light, showing tiny margin elevations, bilaterally. Closed phase of vibration, strobe light. The “original equipment” capabilities of the voice early after successful vocal cord microsurgery (above) have been diminished, but capabilities remain markedly better than they were with the original lesions. Vocal nodules, moderately large, seen with cords in abducted (breathing) position. Phonation, showing early contact of the nodules, and large gaps anterior and posterior to the nodules. Phonatory position, after surgical removal. Note the straightened vocal cord margins. Vocal nodules, with cords in abducted (breathing) position. Note also a thin layer of mucus. Vocal nodules at prephonatory instant under standard illumination. Under strobe light, open phase of vibration. Under strobe light, closed phase of vibration. Open phase of vibration just as vocal cords are also parting (to assume breathing position), strobe light. Note the small “spicule” nodules; these are at the other end of the continuum from “fusiform” or “broad-based” nodules. During phonation, strobe light, high-pitched voice, showing early contact of the spicule-form nodules. Closed phase of vibration at lower pitch, strobe light. 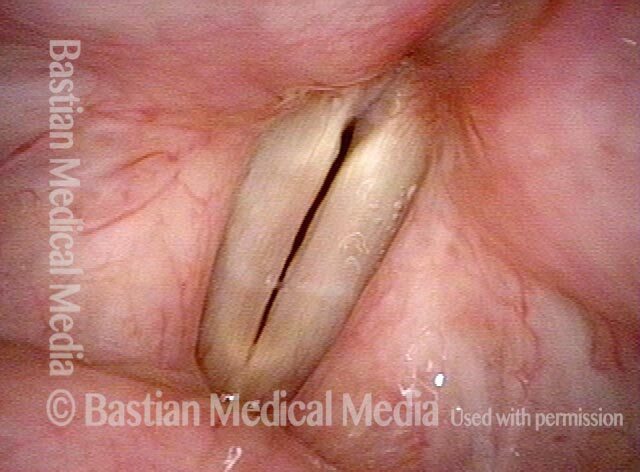 As the vocal cords approach each other to produce voice, note the pointed shape of these small nodules. Phonation, under strobe light, closed phase of vibration, at the pitch C4 (~262 Hz). This patient's voice is notably impaired. Open phase of vibration, showing again the spicule-shaped nodules. Small, spicule-shaped nodules, in a soprano singer, as seen under standard light, in breathing position. This class of nodules is sometimes thought to have no potential to affect the voice (unlike broader-based, fusiform nodules). Young sociable woman in sales, with chronic hoarseness due to broad-based “polypoid nodules.” Breathing position, standard light. Making voice at C5 (~523 Hz), showing large swelling on the right cord (left of photo), and lower-profile one on the opposite cord. Seven days after vocal cord microsurgery; breathing position, standard light. 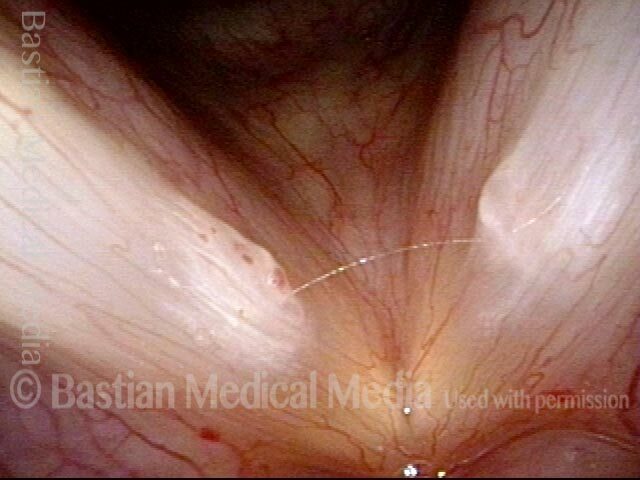 Although there is mild residual post-surgical inflammation of the left cord margin (right of photo), the voice is already markedly improved and normal-sounding. Compare with photo 1. Making voice at A5 (880 Hz). 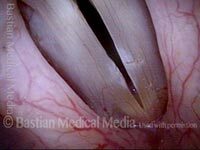 The vocal cords match accurately and both oscillate, despite mild broad-based inflammatory swelling of the left cord margin (right of photo). Compare with photo 2. 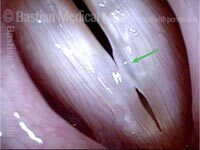 This patient, a physical education instructor, has through vocal overuse developed the broad-based, rounded swellings seen here on each vocal cord. These swellings lack the watery or translucent appearance associated with edema swelling, because they are stiffer and more fibrotic. Phonation at low pitch again, but now at the open phase of vibration. Phonation, very high pitch, closed phase of vibration. Now only the segment of the vocal cords indicated by the dotted lines is vibrating. Phonation, very high pitch, open phase of vibration. Again, there is only segmental vibration, indicated by the dotted lines. Note that the nodules are not seen well during breathing (abducted position). In the same patient, these fusiform vocal nodules are easily seen at the prephonatory instant, and of course (not shown here) under strobe illumination. 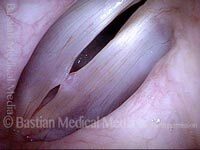 Note the asymmetry, with the nodule on the right cord (left of image) larger than left, and incomplete phonatory closure, causing breathy voice quality and loss of expected upper range. Greatly increased glottal mucus, likely related to acid reflux, and subtle, hazy leukoplakia. This nodule's translucence (indicated by the arrow) is often an indicator of chronicity and that the lesion may eventually require surgery. Man in mid-30’s with chronic hoarseness due to boisterous personality, and work voice demands. Open phase vibration, low pitch shows large left cord (right of photo) polypoid nodule. Closed phase, at same low pitch, mostly conceals the injury. Still at same low pitch, the early ‘closing’ phase shows the right sided (left of photo) polypoid nodule, and the larger left-sided lesion (right of photo). 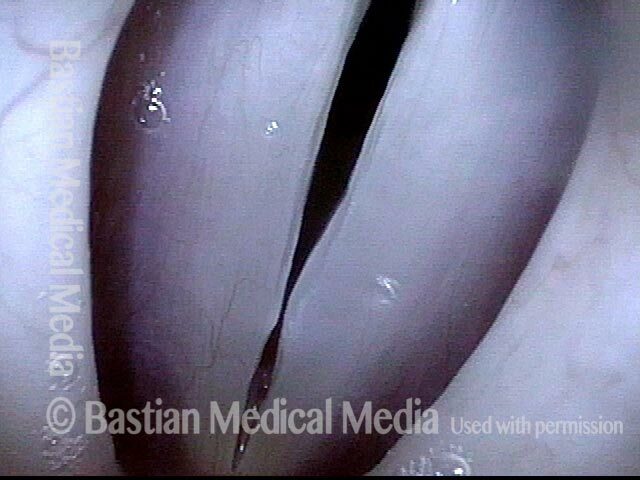 At high pitch, vibration is damped in mid and posterior cords, and only the anterior segment vibrates at arrows. Two hours after microsurgical removal of the lesions, the fresh, 3-mm “wounds” are seen at close range. View while making voice shows straight-line match of the vocal cord margins, and equal bilateral blurring, preliminarily suggesting preserved vibratory ability. Compare with photos 1-4. Open phase of vibration at E-flat 4 (311 Hz). The patient was unable to make this pitch just 2 hours earlier. Compare with photo 3. Closed phase vibration, also at E-flat 4, showing precise match, and verifying bilaterally equal mucosal oscillatory ability. Increased mucus is from the irritation of recent surgery. Semi-professional high soprano with grossly impaired upper voice due to polypoid (fusiform) vocal nodule. Phonatory view shows a degree of muscular tension dysphonia (separated vocal processes), too. Nearly open phase under strobe light at B4 (494 Hz). Closed phase of vibration, aslo at B4. A week after surgical removal of the nodules, at the prephonatory instant, D5, showing margin irregularity. Phonation, with vibratory blur under standard light. Open phase of vibration (strobe light), at D5 (587 Hz). Irregular margins will iron out across time. At closed phase of vibration, also at D5. Note excellent match, bilaterally equal vibratory excursions, and partial correction of the MTD posterior commissure gap. Bilateral large vocal nodules in band singer that does close harmony musical styles. Now under narrow band light to accentuate the vascular pattern. At low pitch (B2 or 123 Hz). A week after surgery, the “wounds” measure about 3mm long (at arrows). Prephonatory instant, standard light, at C#5 (554 Hz). Open phase of vibration at E5 (659 Hz). Voice is markedly improved. Closed phase, also at E5. In a young pop-style singer, the open phase of vibration under strobe light at C#5 (554 Hz). This magnified view is best to see the large fusiform nodules. Closed phase of vibration at the same pitch shows touch closure—that is, that the nodules barely come into contact. Even when patients are grossly impaired in the upper voice as is the case here, the clinician always requests an attempt to produce voice above G5 (784 Hz), in order to detect segmental vibration. Here, the pitch suddenly breaks to a tiny, crystal-clear D6 (1175 Hz) Only the anterior segment (arrows) vibrates. A more panoramic view that intentionally includes the posterior commissure to show that the vocal processes, covered by the more ‘grey’ mucosa (arrows), do not come into contact. This failure to close posteriorly is a primary visual finding of muscular tension dysphonia posturing abnormality. A singer with very large tonsils seen on either side of the photo as she sings A3 (220 Hz). The line of sight is looking straight down from the nasopharynx. At an octave above, A4 (440 Hz), a slight pharynx contraction brings the tonsils closer together. At nearly an octave higher again, G5 (784 Hz), the pharynx has contracted more (upper arrows), causing the tonsils to come into contact just out of the view (lower arrows)--hence the term “kissing tonsils.” This phenomenon can often be seen by looking at the tonsils through the mouth on an “ah” vowel. This young woman is hoarse, but two examinations elsewhere returned no significant findings. Her upper voice limitations during vocal capability testing already tell us “for certain” that there is mucosal injury, even before we look at the larynx. In this mid-range view, we can see early contact at the mid-cords, but the full extent and nature of the injuries are seen in the closer views that follow. Slightly greater magnification and narrow band light point out more clearly the capillary ectasia. Now we know that for complete restoration of voice and of mucosal endurance, surgery will likely be needed, assuming this fits with the patient’s goals. This young “dramatic” soprano is also a bona fide vocal overdoer. Her vocal capabilities have been diminishing for over two years. In this medium-range view, note the rounded swelling of the right cord (left of photo), but more significantly as we shall see, the increased vascularity and mottled appearance of the mucosa. Under strobe light, at open phase of vibration at C#5 (523 Hz), we see a projecting, polypoid swelling of the right vocal cord, but not yet the more difficult problem. Closed phase of vibration, at the same pitch of C#5 shows the mismatch of the vocal cord margins. Is this the entire explanation for this patient's hoarseness? Read on. At close range and high magnification, the open mouth of a right-sided glottis sulcus is seen. This side can be operated safely due to the excess, thick mucosa and would be expected to improve the margin match. 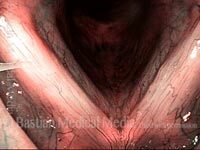 On the left (right of photo), a sulcus is also seen, but the thinner mucosa makes successful surgery on the left more challenging. This video explains how nodules and other vocal cord injuries occur: by excessive vibration of the vocal cords, which happens with vocal overuse. Having laid that foundational understanding, the video goes on to explore the roles of treatment options like voice therapy and vocal cord microsurgery.